If you are looking for smart luggage, motorized luggage, rideable carryon luggage, then you landed on the right page, read on. 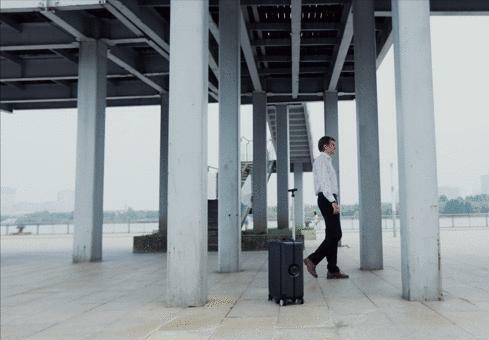 Travelmate: Travelmate is a fully autonomous suitcase that can follow you wherever you go. It matches your speed accurately and can go as fast as 6.75 mph. 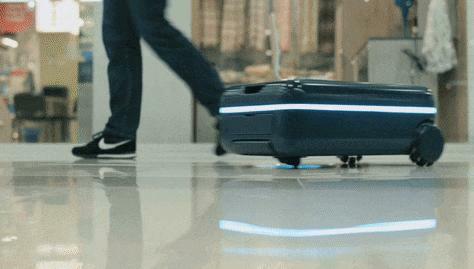 It moves vertically and horizontally when autonomous. It integrates with your smartphone and follows you with ease. 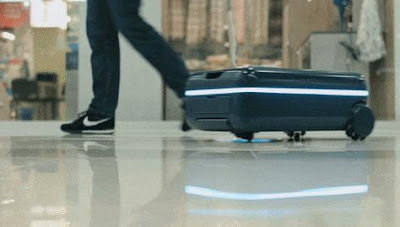 You can even place another suitcase on top it when it's traveling autonomously in horizontal mode. It navigates, recognizes and avoids objects as needed. 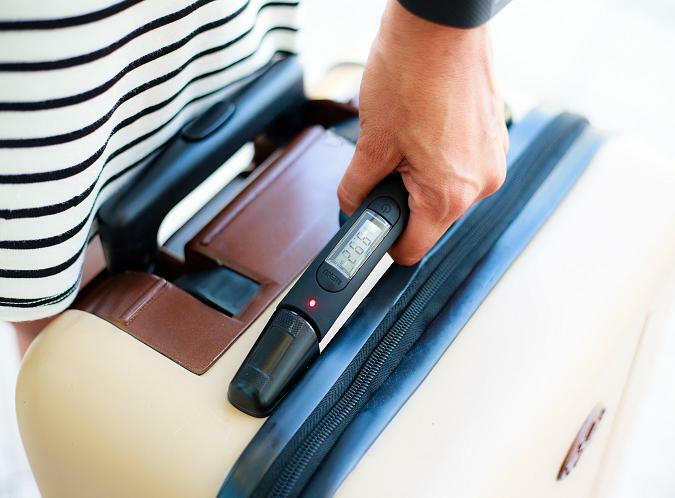 It features omni wheels, our Follow Me system, recharges your gadgets via USB port, and comes with directional indicators that show you exactly where it's going at all times. It lasts 4 hours when in full autonomous mode and up to 100 hours in stand by mode. Pre-order: $399. Trunkster: This innovative luggage features a zipperless entry for faster access, USB recharging, a built-in scale, and GPS. 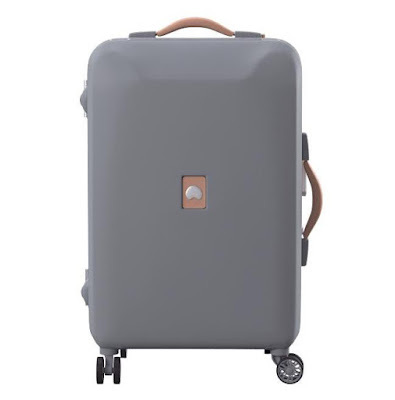 Trunkster's sliding door/rolltop door lets you access your belongings instantly, its extremely durable and waterproof, made of a rigid exterior and corrugated, malleable interior. It also provides an enhanced level of protection, unlike zippers. 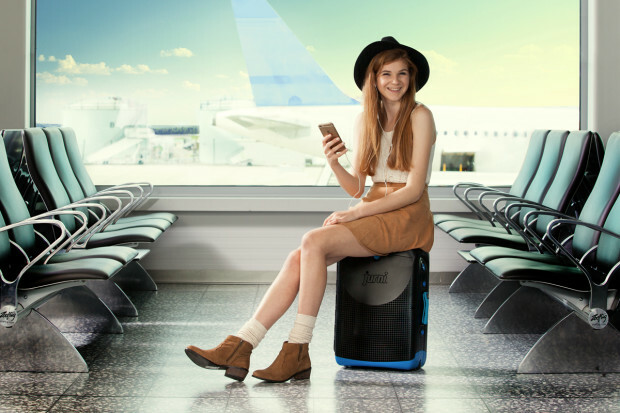 Trunkster can recharge your phone up to 9 times, it features removable power bank that allows you to recharge your devices anywhere you go. 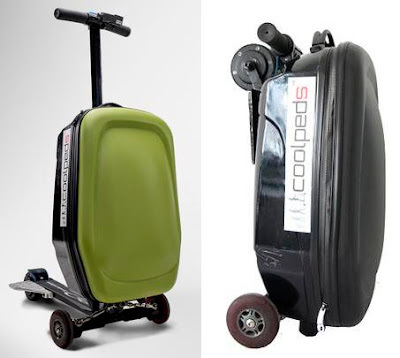 It features a built-in digital scale that works by simply lifting your bag, and can be switched between lbs and kgs. It's GPS enabled that allows you to track it from any connected device, and is activated with the push of a button. Buy Now: $295. Floatti Smart Suitcase: Floatti Smart Suitcase features handbag docking that lets you fasten your handbag, backpack or briefcase securely on top, suspensionride that works for both pushing and pulling actions, removable recharger for laptop and smartphone that can recharge your iPhone 6S up to 7 times, or MacBook for 1.5 times, app connected smarthandle with touch control, advanced tracking, built in scale, removable electronic chamber and secure packing system. Its smarthandle lets you receive notifications, take calls, dial contacts, play, change music tracks, control your camera shutter, compose and send voice-to-text messages and Facebook messages, launch map apps, and more. Pre-order: $320. 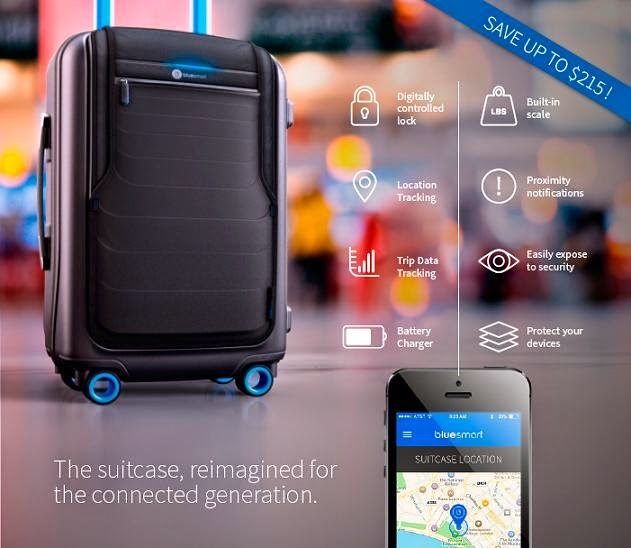 Bluesmart Smart Suitcase: Bluesmart, the world's first smart carryon suitcase that you can control from your smartphone, lock and unlock it, weigh it, track its location, be notified if you are leaving it behind and find out more about your travel habits. What more, it even recharges your gadgets. Buy Now: $449. Space Case 1: This smart suitcase features digital biometric lock, global tracker, digital lift-less weighing system, power bank, Bluetooth speakerphone, proximitysensor, and personal concierge that you can control through your smart phone using its planet traveler app. Pre-order: $750 - $950. 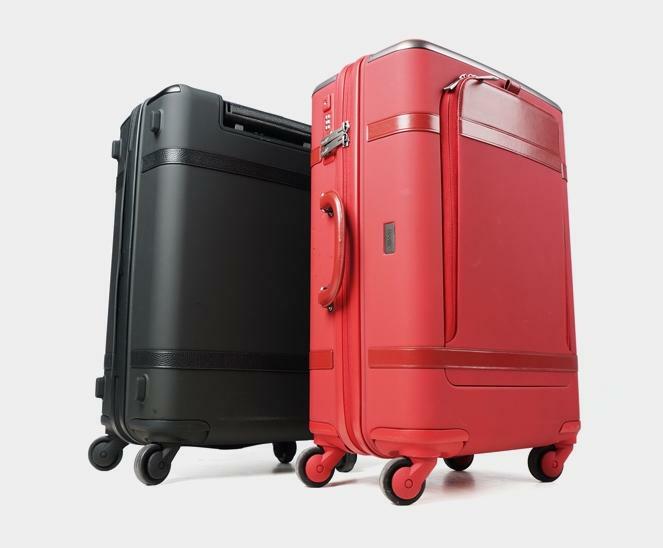 Jurni: Jurni is a carryon suitcase designed for the young connected travelers that features a quick access popoutpod, a seat to rest on, inline wheels to glide-along and flexible storage solutions. Pre-order: About $ 115 (£79.99). 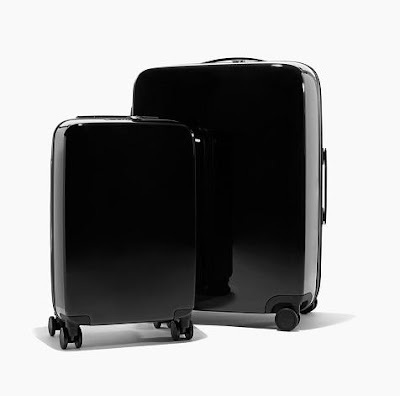 TraxPack's Smart luggage: The TraxPack's Smart luggage features TraxPack stair climbing tracks, mobile device stand, tilting handlecontrol, durable wheels and its optional features include removable power pack, built-in scale, TSA locks, packing cubes, baggage positioning system luggage tracker. Buy Now: $11.99-$139.99. Delsey Pluggage: Delsey Pluggage is a connected luggage that works along with its app on your smartphone. 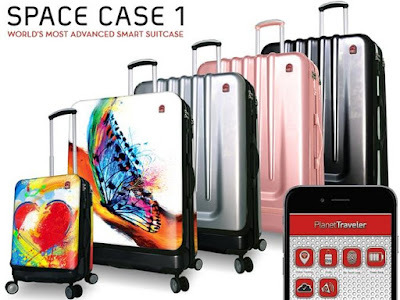 It features auto weigh, onboard detection, check lock, flight info, inside light system, fingerprint id, speaker, weather forecast and more. More info. Briefcase Electric Scooter: The Coolpeds briefcase electric scooter weighs about 7.9 kg with the briefcase, goes up to 10 km on one recharge, speed up to 20 km/hr, features display for speed, range, and power, and USB port for recharging your gadgets. It's easily foldable in seconds, and is similar to a 19-inch standard carryon in size for most airlines. More info. Raden A50 Set: The Raden suitcases are strong yet super light; features double-spinning Japanese wheel bases and polyurethane tires that gives it 360° maneuverability with smooth glide. It features built in recharger that can recharge up to 4x full phone, integrated weighing scale and proximitysensors. Pre-order: $595. 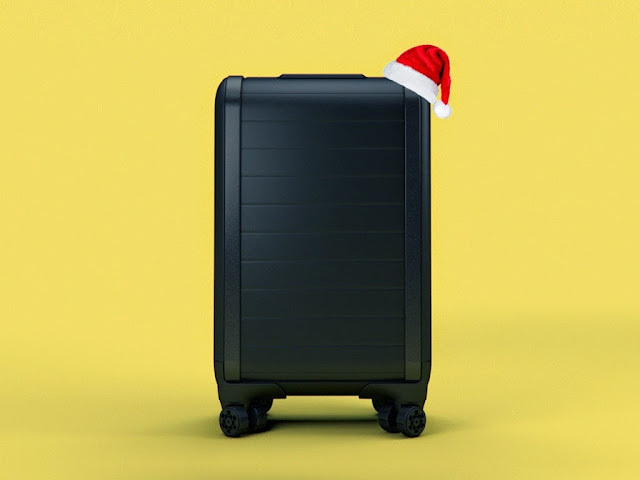 Néit: Néit is a smart hardcase luggage that features a foldable design and takes just three inches of space when not in use. 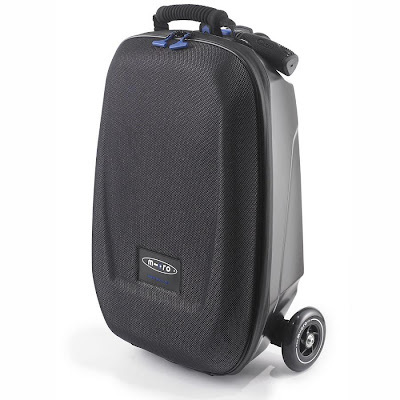 This lightweight case is waterproof and comes with YKK Aquaseal zippers, features 4 foldable wheels, TSA approved lock, GPS tracker, and connected travel app. Using its app you can track your case, book additional flights and hotels, store your boarding pass, check the status of your flight, map your route and more. Buy Now. 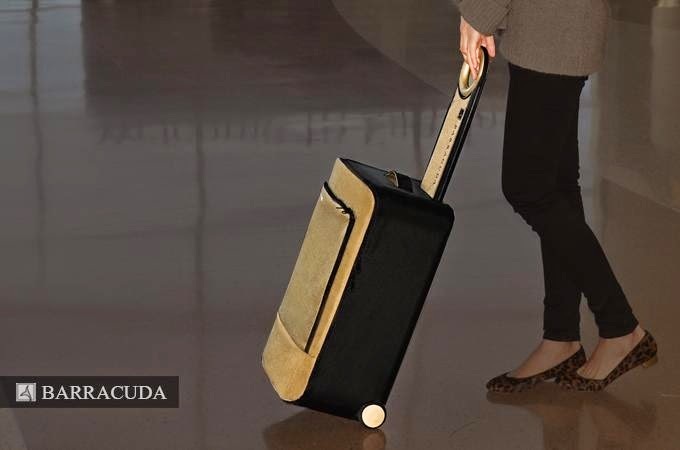 Barracuda: Barracuda is a foldable hardside carryon that features a built-in tray, GPS, ergonomic swivelhandle and a USB recharger. 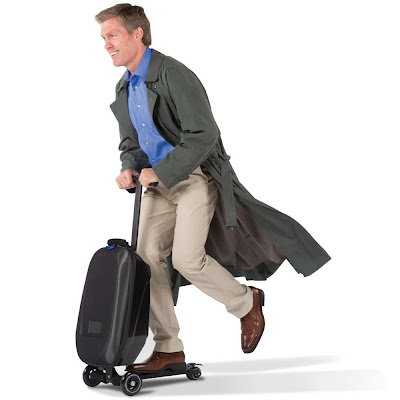 Buy Now: $349. 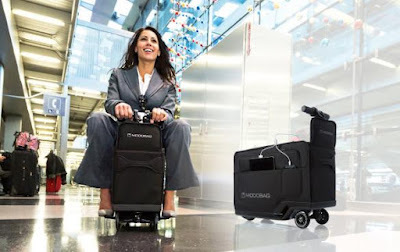 Micro Luggage Scooter: The Samsonite Micro Luggage Scooter is an innovative luggage which can be used as a means of transport. More info.